Posted on January 27, 2008 by Linewbie.com Posted in guides, hardware, tips	. KWin, the standard KDE window manager in KDE4.0, ships with the first version of built-in support for compositing, making it also to compositing manager. This allows KWin to provide advanced graphical effects, similar to Compiz, while also providing all the features from previous KDE releases. 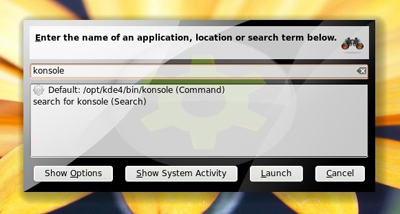 Unlike Compiz, KWin still functions even when not system support for compositing is available, with only the compositing features being unavailable. KWin in KDE4.0 is also relatively new tails and has not been extensively optimized yet, therefore its performance may not be in loads areas comparable with performance of other compositing managers. In such cases performance should be improved with newer versions.Smoothness of KWin rendering can be improved by setting the env.variable KWIN_NVIDIA_HACK to 1. This sets â€˜ _ _ GL_YIELD=NOTHINGâ€™ for KWin, letting KWin use more CPU Time for OpenGL operations, however at the expense of affecting performance of other applications. Therefore, this is disabled by default. This setting may be removed in the future if the negative impact becomes insignificant. For more on this check COMPOSITE_HOWTO. Now see the difference. Tip: In loads cases, overall smoothness may be increased by turning off direct rendering in advanced options in the Desktop Effects configuration module (Alt+F3->Configure Window Behavior). No optimastion or tweaks for ATI video cards that I have noticed so far. If you know, let us know. Tags: hardware, KDE 4, nVidia	. Posted on January 19, 2008 by Linewbie.com Posted in desktop environments, kde, quotes & thoughts	. As one of bloggers from kdedevelopers.org site mentioned correctly, KDE4 and KDE 4.0 are not the same. When people are reviewing and discussing the KDEâ€™s latest release, i.e. 4, they are at times messing up the two terms. KDE 4.0 is not KDE4 but only the first (4.0.0 even non-bugfix) release in a years-long KDE4 series to come. KDE 4.0 is known to have missing parts or temporary implementations (eg printing, PIM, Plasma). Most changes happened under the surface and cannot be discovered in a â€œ30 minutes usageâ€-review anyway. User interfaces being unchanged in 4.0 compared to 3.5 may be still changed/improved during KDE4 life time. KDE 4.0 will not be the fastest KDE4 release, like for KDE2 most speed optimizations will happen later during KDE4. Most applications (many are not even fully ported yet) will take advantage of new features which the new Qt/KDE libraries offer only later. Donâ€™t measure portability success (eg MS Windows) by current availability of application releases, they will come. KDE 4.0 is only expected to be used by early adopters, not every KDE 3.5 user (and IMHO KDE 4.0 shouldnâ€™t be pushed onto other user types like planned for Kubuntu ShipIt [btw said to have only 6 months support for its packages]). KDE 4.1 development will not require the same amount of time as the big technology jump 4.0, expect 4.1 later this year. BTW, do you know that KDE 4.0 can be installed on Windows as well; while using a Windows machine you can take a dive into the ocean of powerful applications, awesome user experience and the freedom Richard M Stallman talks about. An advanced user can compile KDE 4.0 for Windows through the toolkit available, but an ordinary â€˜click-nextâ€™ user will have to wait for a while for the Windows-ready-to-install KDE version. KDE4 – New look, new concepts, less functionality â€” for now! KDE 4: Houston, we have a problem! Tags: kde, KDE 4	. Posted on January 17, 2008 by Linewbie.com Posted in desktop environments, kde	. Somehow KMix is not launched by default when KDE 4 starts, and people who are not aware that it can be launched by simply typing kmix, are lost how they can control volume within KDE 4. So now that you know how to get it there in your system tray, I wanted to show the sheer number of KMix channels offered with KDE 4, that of compared with KDE 3.5 â€¦ wow â€¦ I am quite sure I wont be needing all of them â€¦ perhaps professional musicians will find it usefull. When I launched it the first time, only the first 6 channles were enabled, but then I decided to see how many were there available. All this is with my Creative Audigy 2 ZS sound card. Tags: kde, KDE 4, Kmix	. Posted on January 15, 2008 by Linewbie.com Posted in desktop environments, kde, news	. 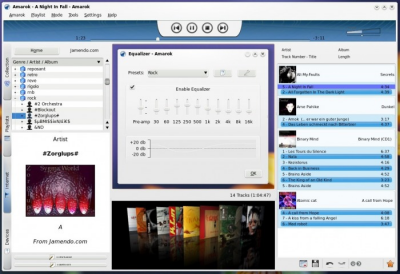 On 11th January 2008, the KDE Community released the fourth major version of the K Desktop Environment. This release marks the beginning of the KDE 4 era. After five long months of development, the most expected project of 2007, KDE 4, has finally seen the light today! KDE 4 is the next generation of the popular K Desktop Environment, which seeks to fulfill the need for a powerful yet easy-to-use desktop, for both personal and enterprise computing. KDE projectâ€™s goal for the 4.0 release is to put the foundations in place for future innovations on the FREE desktop. The KDE Community is thrilled to announce the immediate availability of KDE 4.0. This significant release marks both the end of the long and intensive development cycle leading up to KDE 4.0 and the beginning of the KDE 4 era. The KDE 4 Desktop has gained some major new capabilities. The Plasma desktop shell offers a new desktop interface, including panel, menu and widgets on the desktop as well as a dashboard function. KWin, the KDE Window manager, now supports advanced graphical effects to ease interaction with your windows. Plasma, the brand new desktop shell and panel, is an amazing piece of technology that makes your KDE experience better than ever. Its role is to offer, to the end-users, an efficient and ergonomic access to their desktop. The window manager of KDE 4, KWin, comes now with Solid (a sophisticated hardware API) and Phonon (a multimedia framework) and with some amazing desktop effects. As an alternative file manager, Dolphin is included for those of you who have already been using it. and tonnes of more new and cool features . Lots of KDE Applications have seen improvements as well. Visual updates through vector-based artwork, changes in the underlying libraries, user interface enhancements, new features, even new applications â€” you name it, KDE 4.0 has it. 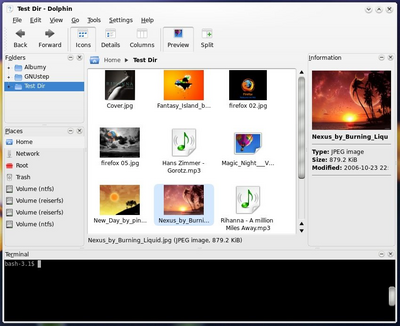 Okular, the new document viewer and Dolphin, the new file manager are only two applications that leverage KDE 4.0â€™s new technologies. The Oxygen Artwork team provides a breath of fresh air on the desktop. Nearly all the user-visible parts of the KDE desktop and applications have been given a facelift. Beauty and consistency are two of the basic concepts behind Oxygen. The KDE 4.0 Desktop and applications deserve a closer look. The pages below provide an overview of KDE 4.0 and give some examples of its associated applications. Screenshots of many components are included. Be aware that this is just a small sample of what KDE 4.0 offers you. KDE 4: A New Dawn for the Linux Desktop? Goodbye Vista, KDE 4.0 Has Arrived! Being the real first release, be patient and donâ€™t expect everything to work flawlessly. This build will still need some tweakings and bug fixing, once the Linux and other KDE DE users start reporting back to developers. KDE users who require mission-critical robustness and the full feature set of the KDE 3.5.x series should probably wait until KDE 4.1 before making the transition. Posted on October 13, 2007 by Linewbie.com Posted in desktop environments, kde, review/preview/tests	. KDE 4 is coming. Itâ€™s starting to look and behave mature enough to use it on a normal desktop. This article is a little introduction to what you might be expecting from the brand new KDE due later this year. Itâ€™s been a whole month when Iâ€™ve investigated the new environment called KDE 4. Honestly I wanted to wait till â€œBeta 3â€³, which should have appeared on 5th October. But as you all can see it has never happened. On the IRC channel #kde4-devel I was informed that the â€œBeta 3â€³ should have been tagged yesterday but unfortunately it didnâ€™t turn out to be true. Not waiting any longer I made my mind and I have updated the SVN and have run the cmake. 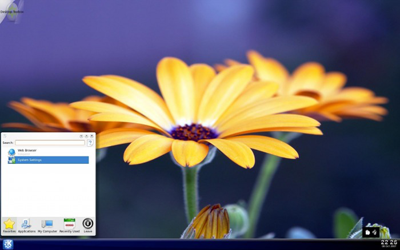 Right after running the KDE you can tell at once that new wallpaper is far more beautiful than the grey old one and the marvelous contrasting flower is well matched to the bottom bar. Unluckily it does nothing more than displaying the clock. The taskbar despite the fact it was on the bar didnâ€™t display processes and all the effort I made to add there any applet or the Pager was in vain, and ended with a complete crash of the bar. The only thing I succeeded in was to put there the Kickoff menubar. 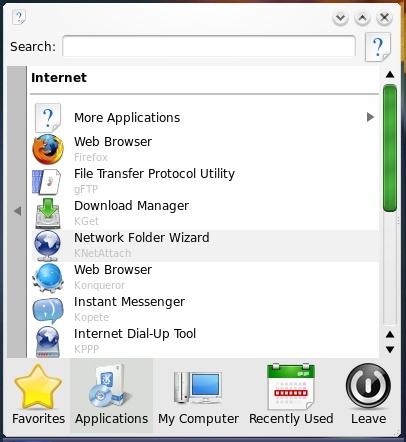 The first appearance of Kickoff was in SUSE Linux 10.2 as a new menu for KDE. The icons were arranged in five categories: Favorite, Applications, My Computer, Recently used, Leave. There is nothing more than the search box that helps you finding applications and documents. Itâ€™s too early to discuss about the new KDE menu even talking about its appearance. IMHO I wish that the searching engine wouldnâ€™t be based on Nepomuk or Strigi. 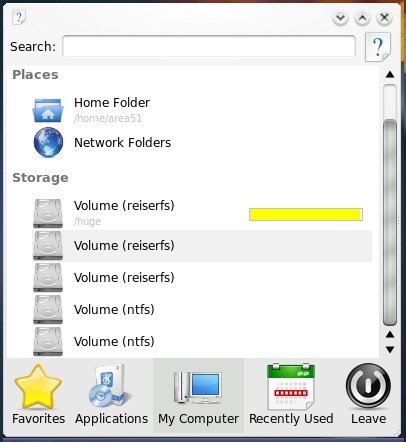 Iâ€™d like to mention that it is only the initial version of this menu in KDE. Iâ€™ve talked about this program a lot so far. Even now there has changed a lot of stuff, not only the appearance but the functionality. Iâ€™ll shortly remind that Kget is the download accelerator that provides you quequing, placing files in a specific directory chosen by some criteria. This version is enriched with the Transfer Graph applet, which shows you the graph of the download speed of current file. Itâ€™s the third applet like this. The first two are: Pie Graph and Bar Chart. Iâ€™m used to some sort of nice rule. All the time I check the state of KDE 4 I meet new Plasmoids – so is now. The first one is the old well-known Network Monitor which transformed from two flushing monitors to the graph that shows the traffic flow. The next two applets are quite new. The first one is the System Monitor. 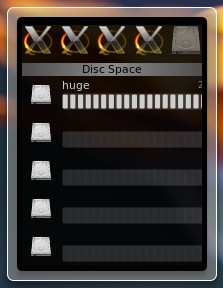 This applet in the intention of the creators will inform you about the state of the main parts of your PC. In the future you can expect for reading ACPI information such as temperature or fan speed. Unfortunately at the moment the applet tries to perform only the usage of the disc space. Today the best applet Iâ€™ve tried was the Color Picker. It helps you to â€œpickâ€ the color of any pixel on the screen. Using the standard tool, the â€œpipetteâ€, you are provided with the color in a few color formats. Very interesting feature it seems to be the probe history that shows a few earlier tries. It seems that KWin Composite effects are defaultly enabled. You can notice shadows under windows and the animated windowsâ€™ minimization. There are also available features from Compiz Fusion that pointing at the left top corner of the screen you are starting something similar to Scale plugin. Switching between windows using Alt+Tab displays thumbs of the windows. Quite interesting is the fact that KRunner looks different from when the Composite effects are disabled. 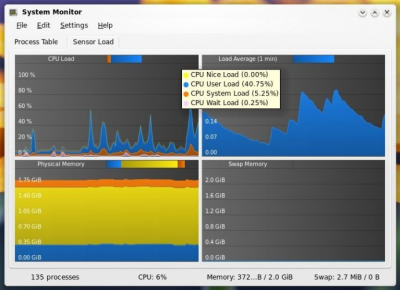 The System Guard has also changed its appearance by the new background under the graphs. It is a rule that I always look very carefully at the appearance comparing Oxygen with Bespin (the unoffical style). IMHO Oxygen still seems too less contrast. I think authors are deserving of credit for continuous improvement. From the last version they improved the appearance of tabs and the highlightment of elements and buttons. 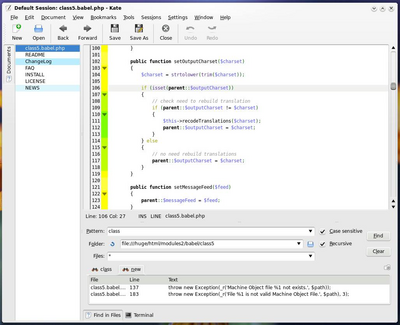 The scrollbar turns to green under the mouse point. But still it is far away from mockups in the Internet. It is the high time to see how some applications look like in Oxygen. Iâ€™ve tried the file manager Dolphin and the text editor Kate. Amarok – at least there is some noise! At the end Iâ€™ve checked my favourite audio player. The best way to describe it is to say â€œsometimes better. sometimes worseâ€. This time I couldnâ€™t manage to make a collection, not even play one mp3 :/ But instead I could connect to Jamendo and listen to their songs. Thanks to that you can see how the Amarok looks like. Tags: foss, kde, KDE 4, linux, oss	. Does an un-confirmed Bitcoin transaction expire? Mark Shuttleworth wants to turn canonical (ubuntu) into the next Apple Inc.